Appearance: Athletic, strongly muscular as befitting someone who wields two handed weapons while running around in plate. Not overly buxom but definitely having curves and a little body fat. Those who see her in dresses like the formal ensemble wear may notice the remnants of scarring in between her shoulder blades that cuts off abruptly. I envision her body looking like this woman's. Fashion of Choice: She prefers strong colors that set off her dark skin tone. She endeavors to always dress for the occasion. She has an opal stud in her right nostril. Alignment: She doesn't really fit with traditional alignment schemes. Motivations: D suffers from ennui. She is re-engaging the world at large in an attempt to shake off the chains of apathy because apathy is antithetical to Hate. Hate is her ultimate goal in others because she believes that Hate inspires and leads to greatness and purpose. Disposition: Her disposition changes based upon her role. When at work, she is completely professional and acts appropriate to whatever her job is. In her free time, she's generally friendly, playful and flirtatious or quiet and observant. In battle or when on a hunt, she is focused, fierce and dedicated. Outlook: D is a pessimist. Sexuality: D is attracted to individuals, regardless of race or gender. Misc. Quirks: D has a peculiar sense of humor that sometimes causes trouble. She has been known to challenge people (or play the Devil's Advocate) just to see how they react. She pokes at things just to satisfy her own curiosity and to cure her own boredom. Favorite Drinks: blood wines, shots of strong liquors like Everclear or 151 when she's pissed off. She drinks, a lot, and has a high alcohol tolerance. Drinking serves as good camouflage. Hobbies: people watching, mischief making, discreetly converting souls to the cause. History: D does not talk about her history in any direct manner. People who talk to her will catch hints of it in her conversation (although this is unintentional on her part), but D always deflects any direct inquiries, both as to her history and to her person. Last edited by Diii on 04/07/17, edited 6 times in total. Dont take this Teir'Dal for granted. 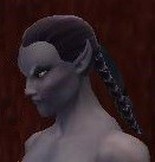 Her motivations and outlooks are more than what they seem, definately a true Teir'Dal. She is fiesty and calculating but definately loyal to her causes. One must worry about her unspoken words and mannerisms for she only speaks when each word holds weight and importance. I would be fortunate to have her an an allie. I'm torn between thinking of this woman as like the older class of Teir'dal or better of the new breed that's appearing these days. There is something fresh about her I would not attribute to the older class, yet she has the firm belief in her dogma an own rituals. There is true faith, not called out to anyone that can see or hear, but kept quietly in a book for your own worth. Though I'm not sure if we could be allies, I know she is true to herself, an that honestly makes me trust her more. I would rather have a opponent that was true to herself than one that is not. Within *minutes* of this tier'dal joining the ranks, she was biting off more than she could chew, and getting herself into all sorts of trouble. Unlike most people, though - she seemed to *enjoy it*. I've clashed with her several times since that day, and will likely do so in the future if she continues to get in my path. For the most part, she's a traditional tier'dal - arrogant, spiteful, full of barely-contained hatred. The only thing that throws me off about her is her tendency to be 'honest'. It just doesn't seem right for her type. I mean, it's refreshing to see her word ring true but sadly, this gem of a personality trait along with her sharp wit and humor, is so overshadowed by all the other stuff. You know, the hate, spite, hate, arrogance, hate, hate, and more hate. I believe her sole motivation centers around her desire to cause as much trouble as she can. She will do things to people to intentionally catch them off guard - just to see (and derive amusement from) their reaction. She caught me like this, I confess, when we first met, but I quickly wised-up, and now she won't catch me off-guard again. I've actually tried to befriend her - without success. I'd love to know if there's anything under her icy exterior other than sarcasm and mischief. I have my doubts, but I've surely seen stranger things in my days. Allow me to explain how I see Diii. She could be thought of as petulant, but only if one thinks she is not at all self-disciplined. Arrogant, but only if one believes she is unaware of her gifts. Sadistic, but.. well yes, sadistic, but only to those she deems are deserving. In my opinion, her judgement as far as that goes is excellent. I witnessed her working with clients of the Soul Fire during the Festival, in the Commonlands. Aside from her obvious and impressive skill at serving clients (I dare say the Dame could find few better in her stead), I was surprised to see that she could be instantly and openly friendly. I am not sure whether this was merely professionalism or if she genuinely enjoyed what she was doing. Occasionally, she would flash a smile at me (working security) as she went about mixing drinks and chatting up the customers. It caught me completely off-guard, served no malign purpose that I can think of, and made my work that night... enjoyable? Whoever Diii is, the entirety of her has not been discovered. She is a complex creature at the very least. I am proud to be associated with her by employment, even though I know the sentiment is not returned due to a certain recent event involving a vithing bard's skull and my boot. I like her. I think. Or I will kill her. I am not entirely sure yet which it will be. I suppose that depends on whether our exceptionally similar temperaments clash or compliment one another. Chuckles softly Yes, I've run across her a couple times. Once at the auction at the end of the Festival of Discord and last night at the Fancy. She seemed to be interested in someone there, and I found it amusing. Either she knows not with whom she flirts or she does and is looking for a confrontation. It will be interesting to note which way it goes. For I am certain from where I stand, she will not get what she desires in either case. Okay, some people might be surprised, but get this: Diii can be the best friend you ever had. When I first met her, it was really hard to get used to how she would just.. talk about stuff. I mean, stuff that might embarrass people. Right in the open! In front of everybody! So then me and Vandall accused her of trying to make trouble, and we were wrong because she couldn't have known she was talking about stuff we didn't want other people to hear. Diii Lesson #1: If you don't want someone talking about something stupid or bad you did or said, don't say or do stupid, bad things. Diii Lesson #2: Some people just flirt. Doesn't mean anything! Maybe they think it's fun, maybe they want to see if people think they're pretty 'cause it makes them feel good, or maybe they even want to make other people feel good about themselves! Diii Lesson #2a: Oh and tell her her armor is pretty and it matches her eyes and they're pretty, too. She likes that. Something bad happened early on when she joined.. Someone made her feel very bad about herself and she thought everybody hated her or something, I think. I tried to make it better but I couldn't.. I mean I probably look like some kid to her. I tried to sound like the rest of the people in the Family do, but I don't think it worked. Anyway, she got better on her own I think, and sometimes we would talk about things, and she would give me advice. Diii Lesson #4: Do not abuse the fact that she forgives way too easy. I've yelled at her and pushed her away when she was just trying to help me not make mistakes, or at least to get me to think about the decisions I was making. She taught me that a true friend doesn't just sit back and watch you screw up... They take the time to slap you around if you need it. So many times she helped me or gave me advice, and I treated her bad for it. And every time, she forgave me. Don't abuse it. Dis girlie 'ere iz funny az 'ell.. an' dat'z sumfin' fer bein' an Inky. She wuz dere when Vandall an' Tennos wuz 'avin' a pissin' match, an' we all 'ad to suffer 'earin' dem jaw back an' forth an' all dat crap. 'er an' I 'ad a few good laughs togevah, watchin' dem.. she'z a good girlie, iffen yah ask me. Don't fink dat means Ah trust 'er, Ah sure az 'ell do not. But at least she saved me sanity from 'earin' da two boys strut 'round tryin' tah show off dere featha's. She likes tah talk in Thexian though. Ah don't like dat. Kinda makes me wanna crush her skull. The Teir'Dal sits by the fireplace staring into the flames, pondering deep thoughts as the interviewer approaches. He turns, smiles and flourishes a hand. "Good day to you again sir. I expect you have a new individual that you wish to discuss with me?" Eisfyre sipped more of his coffee and thought for a moment as he heard the name. He glanced back into the fire as a log popped and shifted in the flames. 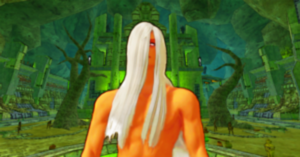 "Yes, I have seen Diii several times, both at the Soulfire and the Bronzevat. At first I thought her merely a pretty serving girl, who was dedicated to her tasks and a bit flirty, which I enjoyed." He turned to the interview again with a thoughtful look on his face and continued. "At the Bronzevat, however, she was not at work and I saw a new side to her. She seemed confrontational, to a fault. I decided to spar with someone, which I rarely if ever do, when she began egging us on. After it was over, she seemed to enjoy continuing to provoke. First, she said something to encourage me, then said something to encourage the other." "I tried verbally sparring with her, in a reasonable manner, but she did not abate. Of course, neither did I, which was my own fault. This finally prompted a sparring duel between us. She fought fiercely, but made some mistakes that I was lucky to take advantage of and manage to win. Did that stop her? No! I had told her I don't like to fight and my sword is for little more than show, but she insisted we go again. Well, it was a grueling affair and I barely managed to escape with my life intact." "I'm still curious to learn more about her, but I'll be Much more aware of who I'm talking to next time." He nodded firmly towards the interview to signal that he was done and sipped some more coffee as he stared into the fire again. 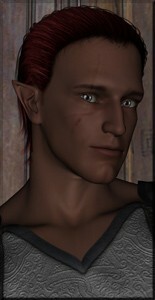 The scribe progressed somewhat timidly toward his intended target for the interview; a very tall,ruby-complexioned elfin male drifting about various mercantile buildings under the midday sun of Ro in Maj'Dul. The male didn't address the scribe or even motion in his direction; his demeanor that of a bored and/or distracted child. The faint, musical jingle of his numerous earrings and various hair ornaments stopped. At last, he whirled to face the scribe upon a large heel. The unwary man took a few steps forward--evidently a few steps too close into the demon's personal space bubble, judging by the soft, dangerous tone he spoke with. He'd broken the sacred space, and now he was going to suffer the immense yet discreet intimidation Rah provided consequently. "Who, today?" Rah chirped, and shook his head at name. His expression rapidly lit up as he was given the details regarding her physical description. "I believe...she graced my aunt and I with her presence at the Club last eve. 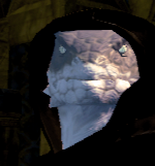 An absolutely stunning, stellar specimen of Teir'dal. All children of Hate should aspire to be more like her. I am not often impressed by mortals, you know." The following flat expression washing over his features served to reiterate that silently. "She did not reveal more than that which was absolutely rudimentary to aid greetings and conversation..." Rah's dulcet tones paused for a moment. It seemed to go without saying: one such as himself can smell the presence ulterior motives like a piranha catching the scent of fresh blood in the water. Not what they were, rather, but that they were present. "Wise. One never shows all of their cards to a complete stranger. She spoke of a friend that is dealing with quite a predicament currently. I regret that I did not say this directly to her, but...I should be more than happy to offer my services to help said friend, were they needed." Ah, yes, I've met "D". I had an interesting conversation with her yesterday evening regarding the measure of success or failure in an entire race, and in an individual. We seem to share the opinion that victory in war, with little regard to other accomplishments, is a poor measure of the entirety one can judge a species' historical importance. She seems to have a cutting sense of humor and speaks her mind directly and without hesitation. 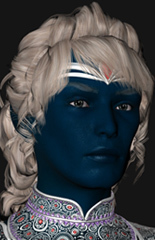 But then, she also spoke of the subtlety of her people--the Teir'dal--and I would have to assume this pertains to herself as well as being a general statement, and makes me wonder what lies beneath that bold, spitfire persona. If I chance to meet her again, I'll have to remember to thank her for paying my bar tab.